Situated on a point on beautiful Morrison Lake, this 4 bedroom home with a brick wood-burning fireplace is a welcome retreat all year long. You can walk to the 18 hole Morrison Lake Golf Club at the end of the private drive, cast a line off the dock for bass and bluegills or enjoy water skiing on this 320 acre lake with an island. Only 25 minutes by expressway to the city of Grand Rapids and an international airport. 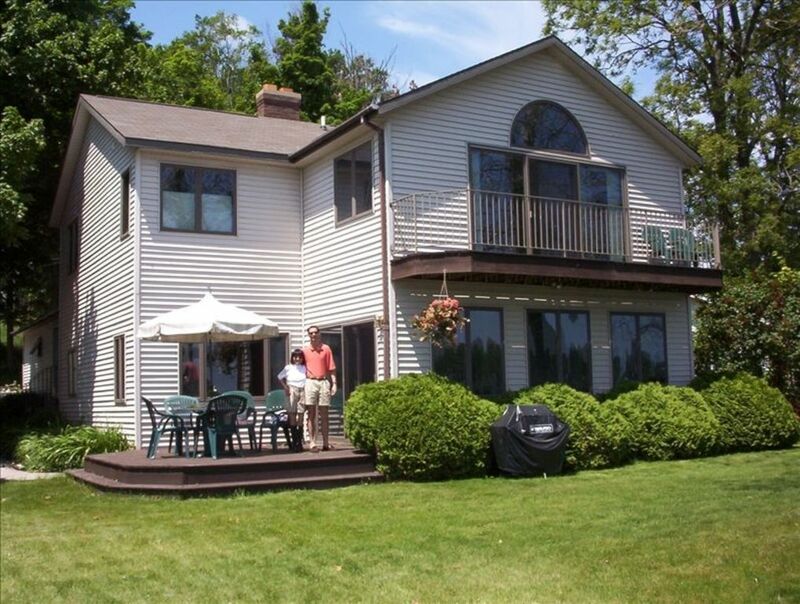 This home boasts hardwood floors downstairs and a heated whirlpool upstairs overlooking the lake. The large 2nd floor master bedroom has a vaulted ceiling and sliding doors to a balcony. A swim raft, paddle boat, 12' aluminum fishing boat with an electric trolling motor, dock and powerboat lift are all included. Third party pontoon rental is also available. The lakefront home faces the east so the sun will welcome you in the morning but won't be blinding you while you relax on the shaded deck in the afternoon. Enjoy your lakefront view from the deck, balcony or around a campfire under the sycamores! I grew up spending my weekends at my grandfather's cottage on a inland Michigan lake near Grand Rapids. Fishing, boating, swimming, horseshoes and barbecuing were the order of the day. I always had a great time! I treated my friends, made new ones and got to know my cousins. Water and sun were the basic ingredients. I bought a lakefront home to pass along the legacy of good times begun by my grandfather and to share it with others as well. Convenience, beauty and fun in the sun are a few of the benefits of this lakefront home. An all-sports lake with a public golf course and bass tournament quality fishing only 25 minutes by expressway to a major city provides guests with plenty of options. You need only bring your swimsuit and golf clubs because a fishing boat, paddle boat, diving raft and linens are all provided. A boat lift is available for open bow speedboats under 20 feet. In winter, returning to the wood burning fireplace and heated whirlpool overlooking the lake after x-country skiing or ice fishing makes for a perfect day. plus juicer, mixer, blender, toaster oven, electric kettle, etc. Excellent fishing off the dock with swimming raft, paddle boat, boat lift, 12' aluminum fishing boat w/ electric trolling motor. Third party pontoon rental available. Portable three person fishing shanty and several x-country skis provided. Sandbox near water for children. Model aviation park and exotic petting zoo nearby. Third-party pontoon rental available.